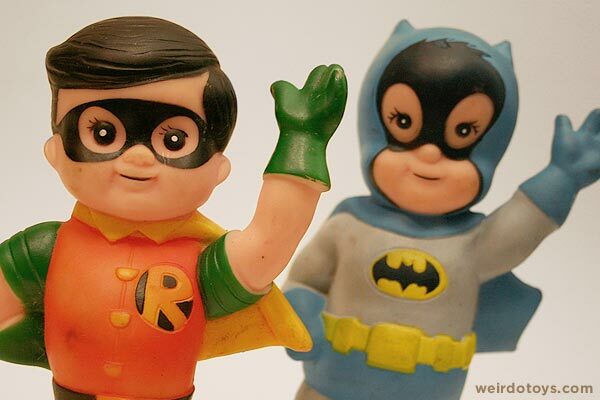 It’s Batman and Robin as you’ve never seen them before. 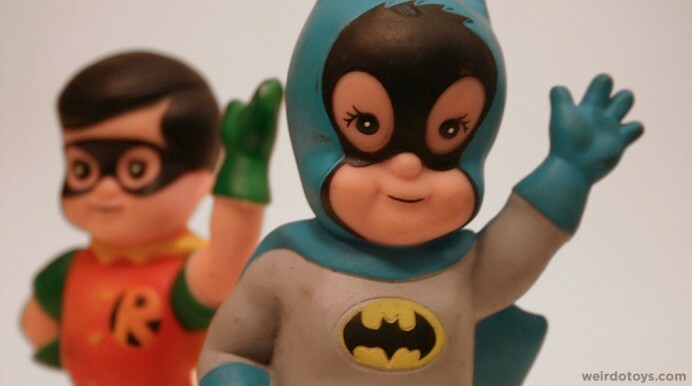 They’re 7″ vinyl squeeze toys… and they’re babies. These lil’ fellas were my first find at the Allentown Antique Toy Show. 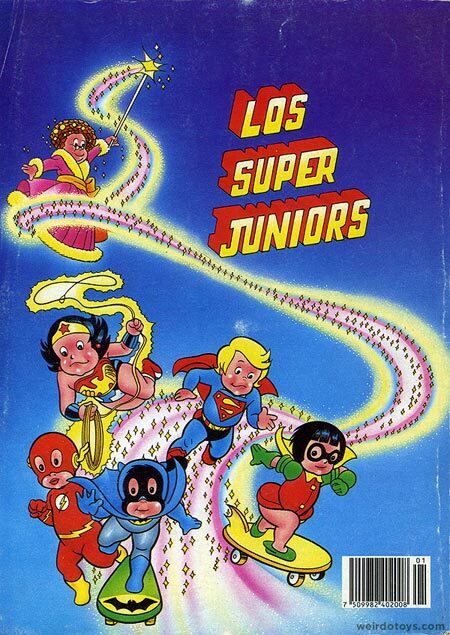 From what I can gather from the legal info on their feet, these toys are called Super Juniors (©1978 DC Comics). 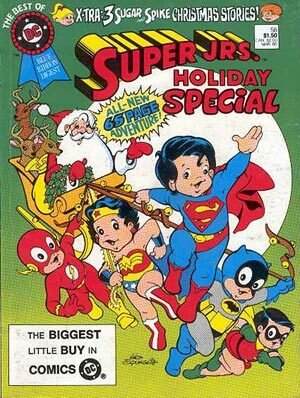 I found no true origin for these toys, but I have discovered a couple of Super Junior comics that were printed in the 80s. I’m not sure if there’s a direct tie-in with these dolls, but the character designs do seem similar. 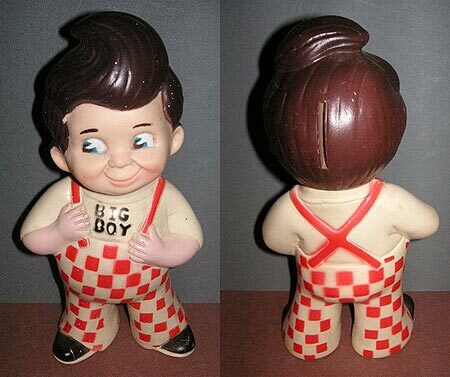 So, is anyone else like me in thinking that these toys look a lot like the old Big Boy restaurant character? 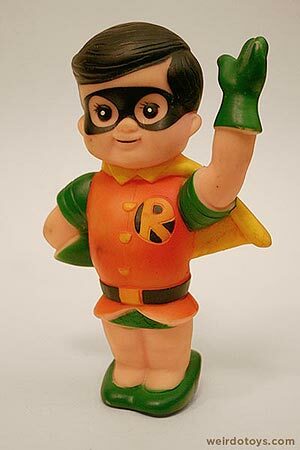 Only thing Batman and Robin need are hamburger trays in their hands. Either way, the dynamic duo never looked more precious. 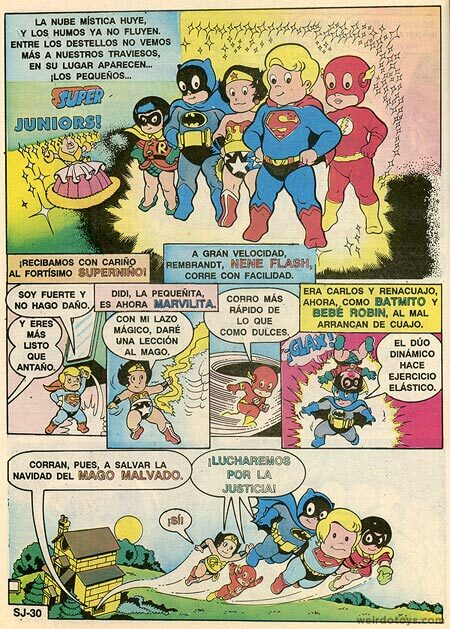 I recently got my hands on the old Mexican Comic, Los Super-Juniors Edición Especial, previously mentioned in this entry. I was hoping it would provide some good reading or goofy images or something. Well, as it turns out, there really isn’t much good stuff in there. The drawings were mostly bad and the panel layouts and stuff were just badly composed. Here are a few of the most decent images featuring the Super Juniors as a group. If I ever get really, really bored, maybe I’ll go through this comic again and find some more pages to post… or I’ll get an intern to do it (I’m looking at you Doddsy-boy). 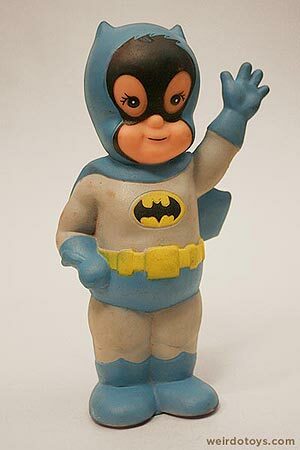 I actually Had the Batman Super Junior and the big boy as a kid. I just had one of those flashbacks I get from time to time. That’s how I found this site. 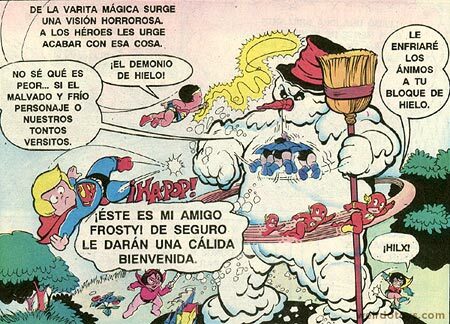 When I was a kid – 3 to 5 years old – I had bed sheets with all of these characters on them (w/o the Shoney’s Big Boy). I thought they also included Greens Lantern and Arrow. 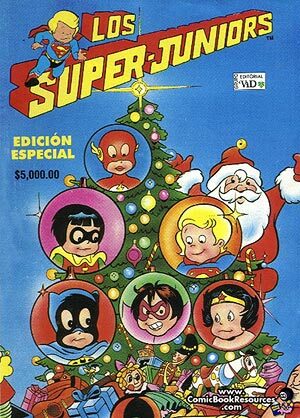 Btw, “Los Super-Juniors” was a $5,000.00 comic book? I wouldn’t have paid over $4,000.00. Nice photos! I have this set of vinyl figures & they are some of my most favorite pieces. They’re just so weird looking. They also made a Superman & Wonder Woman, those are cute too. I can’t read any of that comic! Justin, you know I don’t speak Spanish! so how much do they actually cost? Have a pair of “baby batman & robin” paint is a little worn, but they are cute…any idea how much they are worth or who would be interested in them? 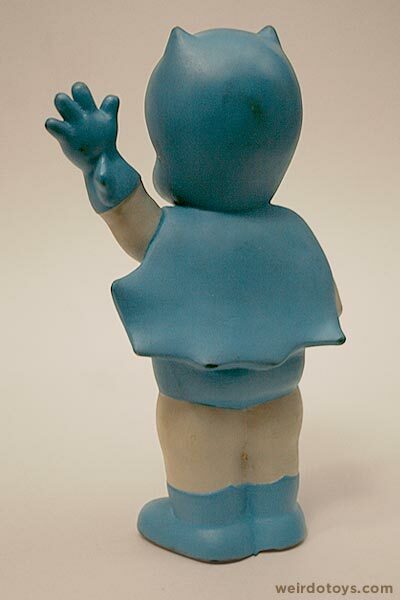 Have a lot of vintage toys for sale. Wow! Thanks for sharing. That quilt is great! 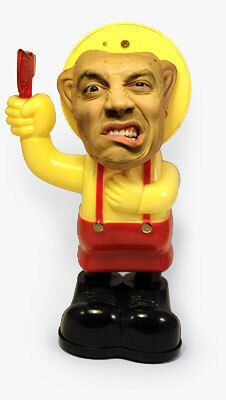 Too bad they didn’t make toys of all those characters. 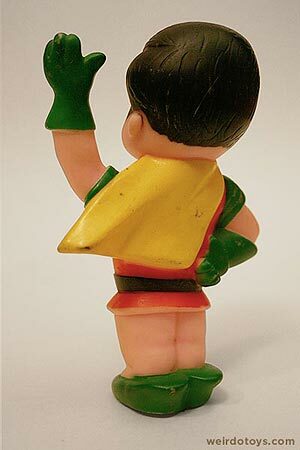 I think they only made Superman, Wonder Woman, Batman and Robin. How much is a super junior batman worth? I have some super jrs. wallpaper says dc comics 1979 anybody know anything about it?